It’s over for another year, and already Jensen has put in his request for another Peter Pan party. I can’t quite believe he’s old enough to know his own mind, but then I remember he’s four years old, not four months….and then I get a little teary that my boys are growing up. How my Baby Dragon, Lyoto, came to his second birthday so fast I’m not sure…but it hurts just a little more than I thought it would. 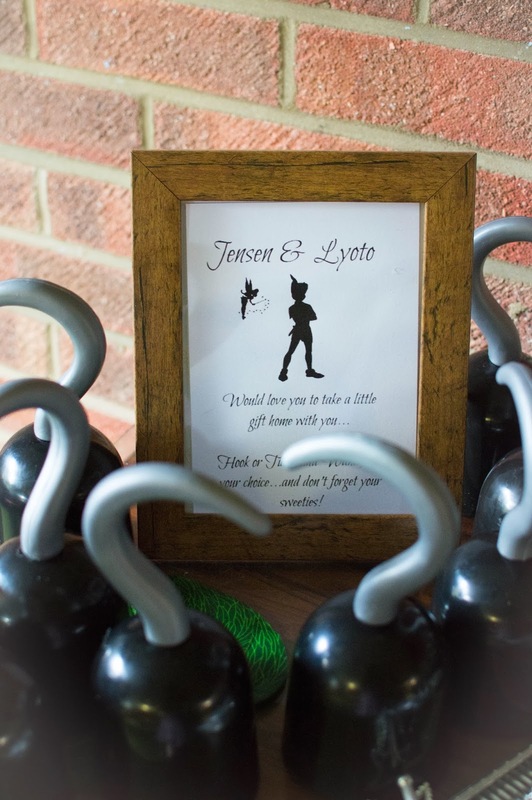 As our boys are born on Valentine’s day and the day afterwards, we typically now celebrate their birthdays on the actual day, and push their party back to the weekend following so that we can stretch the fun out over the month. After debating testing our cake-making skills for the fourth year in a row, we conceded that as poorly, pregnant, one-woman-party-catering-band, I had quite a bit to contend with already without the added stress of using fondant whilst under the scrutiny of a very particular Peter Pan fanatic, and so we opted to have a cake made to his design instead. Very kindly Dadda drove the 65 mile round trip to collect it and bring it home safely, to the biggest, most awe-infused smile I’ve ever seen on Our Little Adventurer’s face (when looking at food). 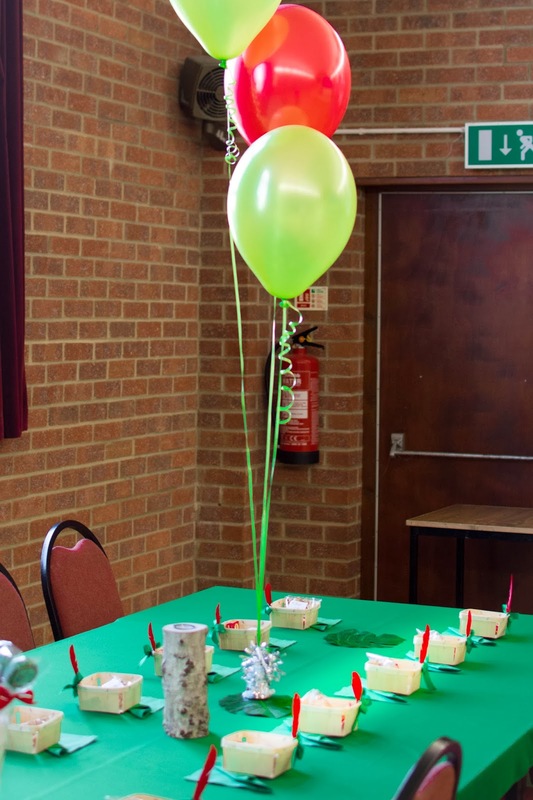 I had an hour and a half to set up the hall for the party, AND take the photos with the awful incandescent and fluorescent lighting and so there are fewer than I’d like, but I tried. I told Dadda that next year I’m bringing lighting. Lots of lighting. 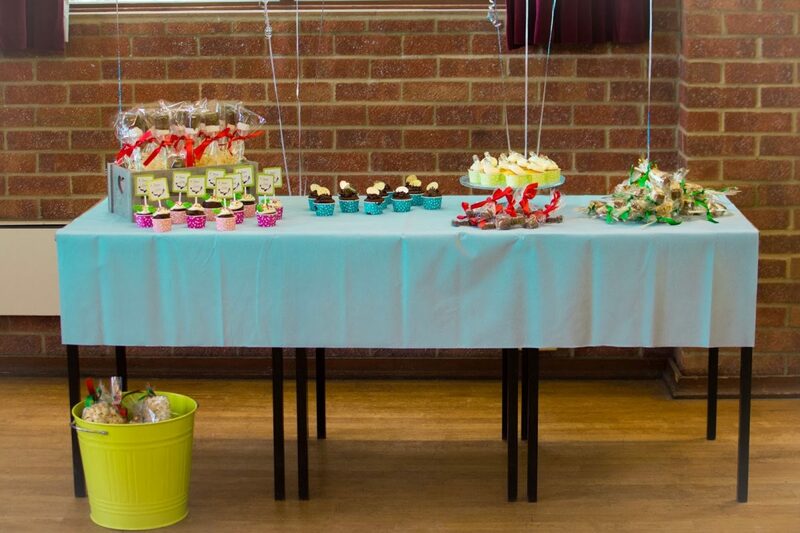 The dessert table was framed with light blue balloons. I try and bring some colour (I love rainbows) to the dessert table every year, whilst staying within the chosen theme. It’s hard to set a whole hall up with bouncy castles too in an hour and a half so it never gets to be as cute as I’d like. One day. Maybe. After rethinking the whole dessert table around ten times (and drawing little pictures of it), we kept it simple. 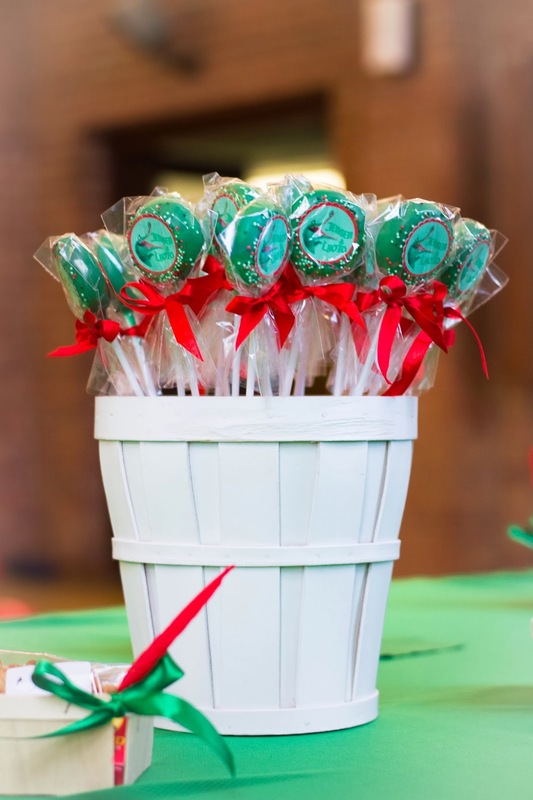 Three types of cupcakes, Mr. Smee marshmallow chocolate pops, Rice Krispie lollipops, Captain Hook’s chocolate (Valentine) codfish, and Peter Pan popcorn, which was popcorn with red and green smarties added. The three cupcakes were the most fun to make. First we had the Croc-cake. Jensen assembled these, sprinkled them and proudly handed each one to me the night before the party. Tick Tock was hiding in the frosting. 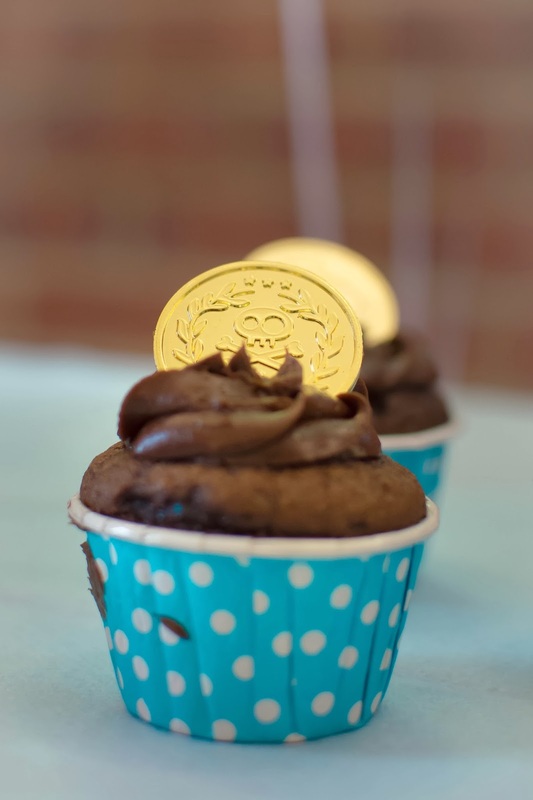 The gold doubloon cakes sadly met with a bump somehow on the way to the party and got smooshed. They tasted good though! It also might have helped if I’d not been crouching and wobbling to take the photo. Finally, we made pixie-dust cakes. These were lemon sponge with vanilla buttercream, and a little souvenir, edible pixie-dust! We had so much fun making these and even more fun seeing little faces light up as they squirrelled their little bottles away like treasure to take home. I set up the lunch table at the far end of the hall for 24 little people, and it overflowed with little faces, trying to avoid eating sandwiches before frosted cupcakes and chocolate-dipped, glitter sprinkled marshmallow pops. I loved the tablecloth this year. The night before the party I was still frantic and calling every store I could think of that would have a green tablecloth since I’d had no luck anywhere I’d frequented so far, and I drew a blank. On the brink of breakdown, I was desperately trying to figure out how I could get to Southampton before the party when I realised that Grandad was picking up my aunt (also my godmother) from Southampton docks as she lives on the Isle of Wight. Even though Grandad is colourblind, I knew my aunt would understand what I was looking for when I said “Peter Pan green”. Sure enough, at just over £1 a metre, they delivered! I put the red tablecloths away with glee. After buying nearly 2,000 berry crates from a lovely farmer last year for next to nothing, they invariably show up at every celebration we have. 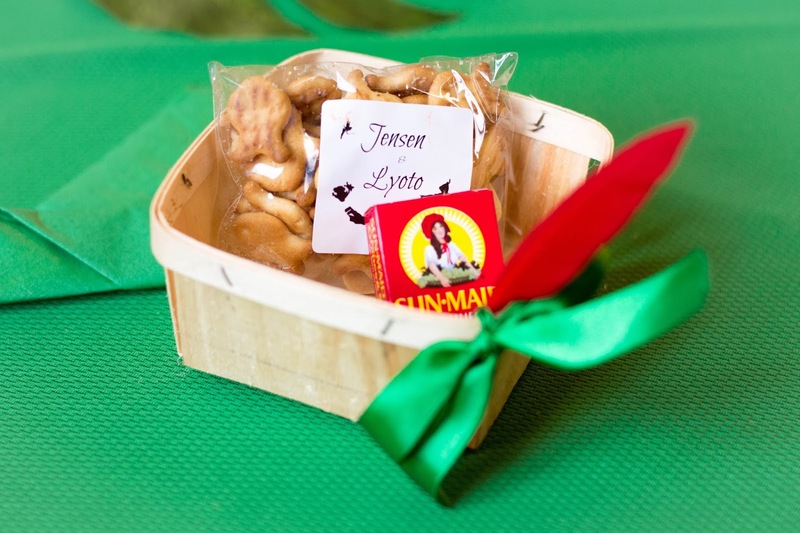 This time they were garnished with Peter Pan’s magic feathers and a green ribbon, and filled with fish crackers and raisins. After obsessively positioning them on the table and repeating “feather right, feather right” to myself over 25 times (baby brain has already taken hold), they looked very sweet in a line. My very kind niece also folded little napkins like Peter Pan hats and tucked them at right angles under the crates. I decided to serve the crackers in little bags this year to try and make things easier on little fingers. 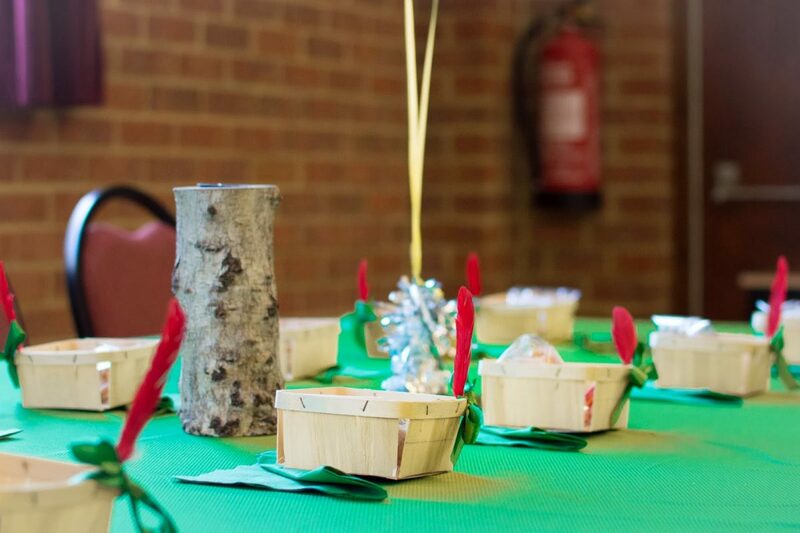 The sandwich-and-sausage-roll-table was decorated with the cutest little plates I could find, and a picture of my eldest Peter Pan (our smallest Peter Pan, his shadow, is very hard to catch), attached to two gold star balloons so that we had a second star to the right. But those plates….I even considered importing them at one point until I managed to locate just the right amount one day on Amazon. They are that small and perfect. Our very favourite Cake Pop Princess made us our annual supply of what my Mum calls, “cake on a stick”. Tick Tock had managed to infiltrate the party shenanigans very little this time and so it was natural his face should appear on them. For the second year running, I managed not to even get to taste one…and so I know they must be good! After singing “What’s that smell in the galley?” about two hundred times whilst driving in the car since the acquisition of the Jake and the Neverland Pirates CD in Walt Disney World last year, it came as no surprise when Jensen asked for roasted rocks and seaweed soup for the grown ups. We never leave a grown up out of the party and so Mr. Smee obliged. 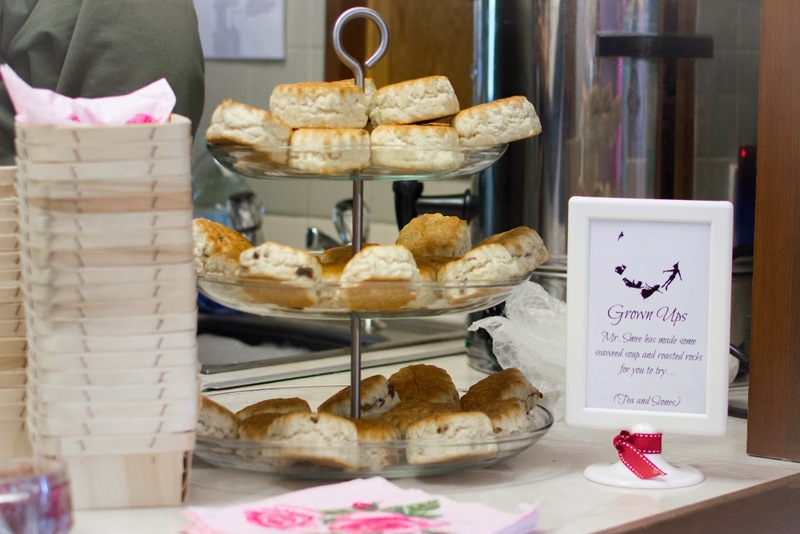 The rocks were a little sweeter with raspberry jam, butter and clotted cream. 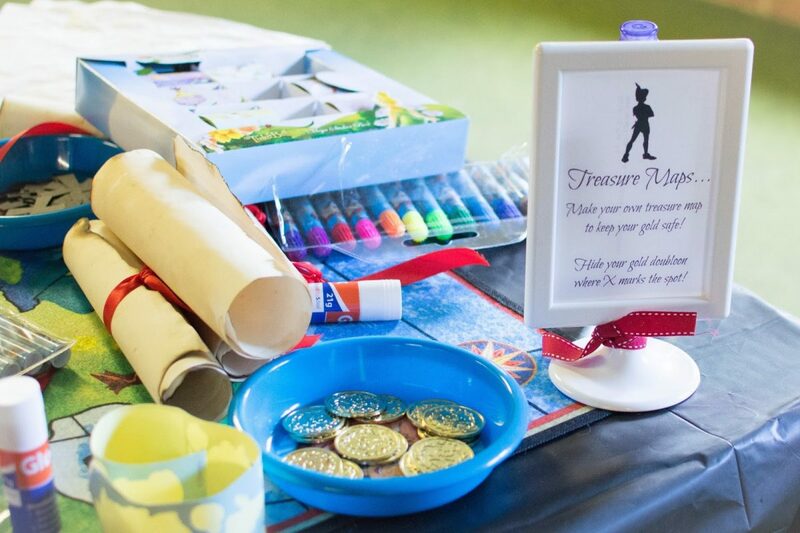 For those who were all bounced-out, we set up a treasure map making station in the conference room. Tea-stained paper, doubloons and black x-marks-the-spot crosses were laid out with new Jake pens and Tinkerbell stickers, ready for little fingers to get creative (and big ones… Grandad made one too). 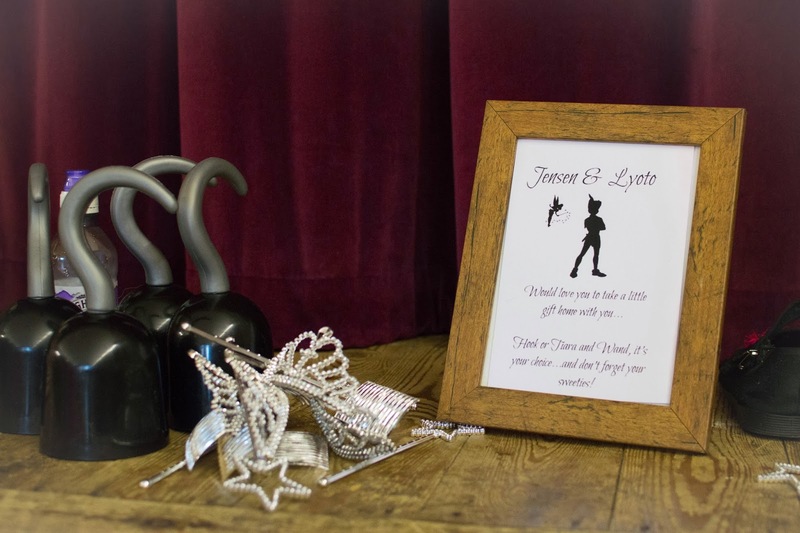 This year Jensen decided it would be fun to give hooks, wands, tiaras and sweeties out to his friends and so bags were assembled, and ready to go at the end. So those were the details! Coming up… Party Fun! Not only are the decorations first class, but that cake! That cake came out beyond amazing. You must be so happy! That's just about the cutest party setup I've ever seen. You did such an awesome job! Oh my gosh! This all looks so perfect and wonderful. What a great idea. All of my kids would love this for a birthday party! So cute! Everything looks so amazing and makes me wish I was invited :). All of your special little touches really are special. I have two parties to plan for and I'm going to use some of your ideas. This looks like a great party. All the decorations are great. That cake is fantastic. oh wow so love the decorations, that cake is so pretty and the cupcakes look so so cute, I miss how cute birthdays were when you're a kid. I love all the details, so pretty! I love organizing parties but never got to do it in a while. The last one was in 2012 when my son turned 9. We made his parties simpler after that. What a fancy party! We love Peter Pan! 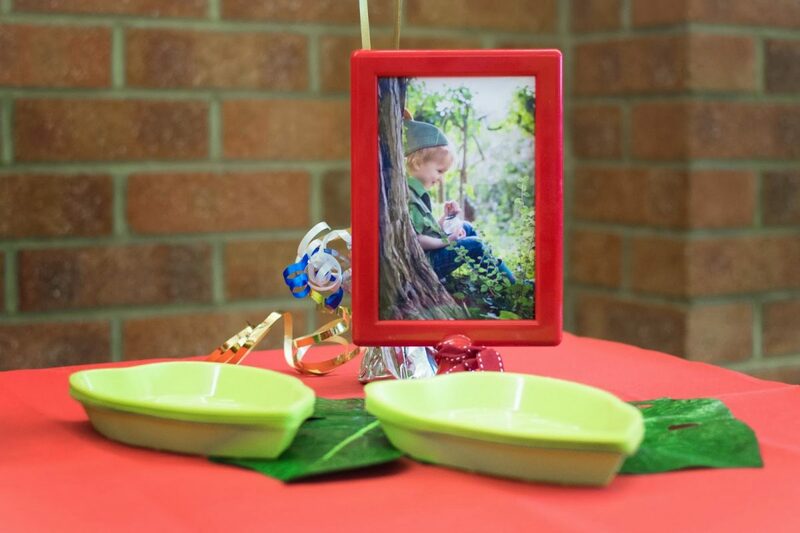 We love Peter Pan and Tinkerbelle in our house. I am loving those cupcakes with the pixie dust in them. What a fun party! That cake is pretty awesome, too. Everything looks so nice. The first I heard of edible pixie dust was last year. I think that's a really cool concept! What a great party. I love all the small details and the cake is amazing. I love, love the cake. Oh my gosh! That party looks like so much fun! What a great idea! 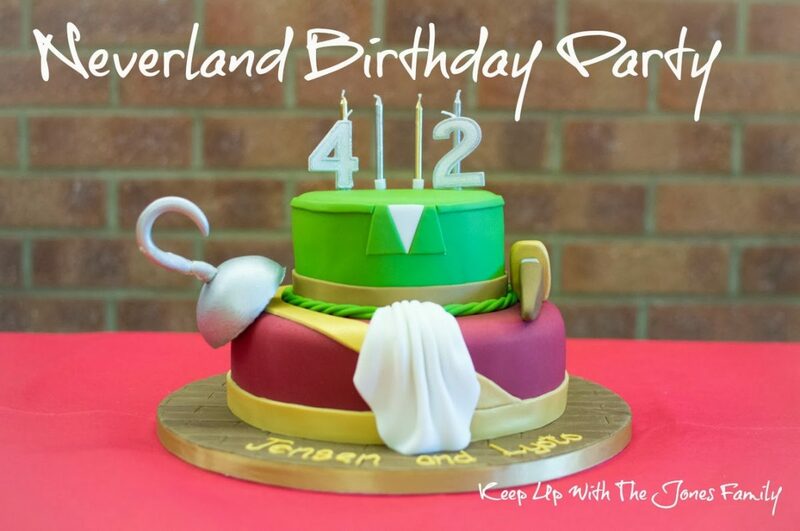 What a great idea for a birthday party, I love Peter Pan! That cake is simply amazing and all the detail that goes into the favors and food looks amazing. Oh My Goodness!! What an amazing party!!!! That cake is fanTASTIC and I love all the detail you put into the party! You did a beautiful job. All of it added up to a magical party… I want some of that Dixie dust. Wow your post and pictures came out great. Your so decorative and crafty. My kid would love seeing a party like this. This is a fantastic party. So amazing. It's like Disney set it up themselves. Nice job! Wow, beautifully-decorated cake (and amazing that he drove 60+ miles to get it! ), and amazing looking desserts! Your son was super-lucky to have that, and such wonderful parents. 🙂 Congratulations on everything! Awww what an amazing party! Your photos are fantastic! i really love the cake! 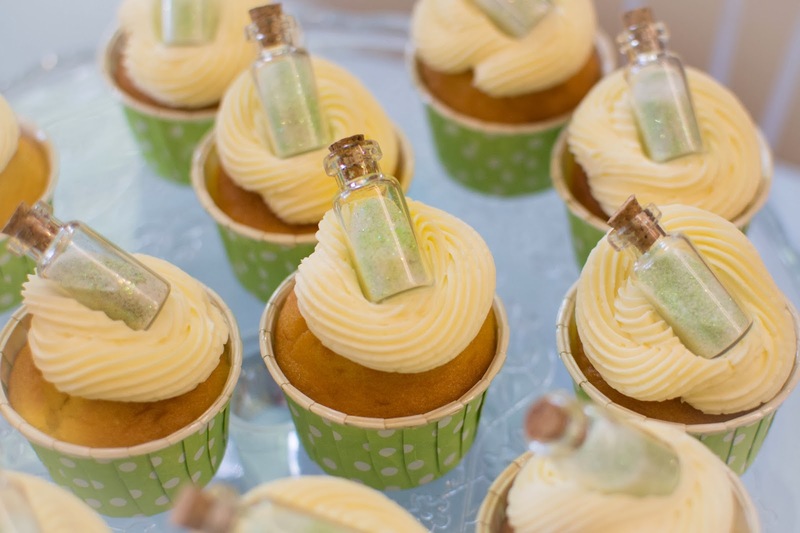 I love the edible pixie dust in the little corked bottles – what an inspired idea! And you photos came out great, no matter what you say! I love this idea for a party and I love all your decorations. My sons birthday is coming us and i'm not to sure what all I will be doing. 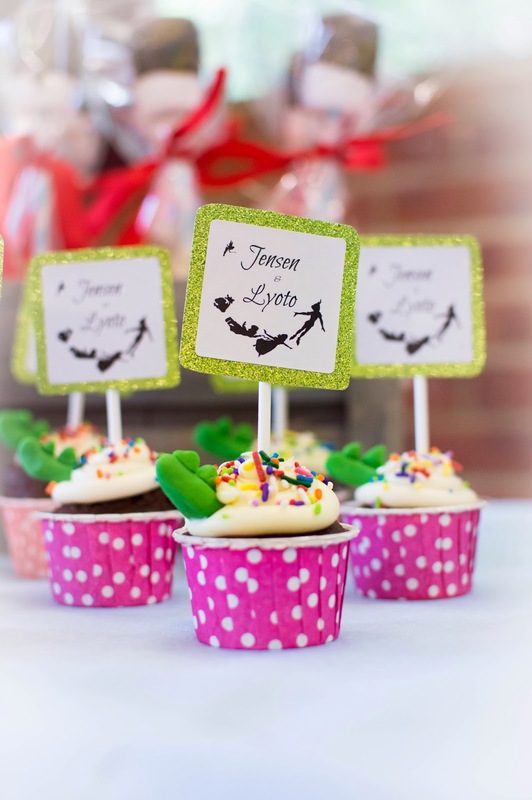 The cupcakes with the little message bottles are absolutely adorable…I am in love. All of the tasty edibles look so well done. Looks like a magical party setting! I also like the GrownUps station – very cool. Oh I just love it. I really love that cake it is so really cute. I love a great part with awesome decorations. This party was awesome. Those cupcakes are adorbs and look yummy. I'm sure the boys and their guests had a great time!